The Global Brands-owned RTD range launched its campaign to find a new flavour in June, reaching more than six million consumers across social media and receiving more than 33,000 new flavour suggestions. These were then whittled down to four suggestions: Watermelon, Raspberry and Pineapple, Violet, and Wild Fruits. Watermelon, championed by Geordie Shore star Sam Gowland, received more than 19,000 votes out of 35,000. The new flavour will be released in February 2019 in 275ml plastic and glass formats. The expression will be available ahead of release in select Deltic nightclubs in November during VK takeover nights. 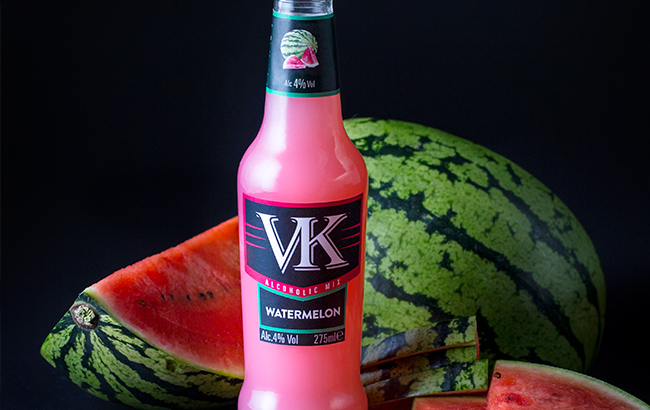 Watermelon will join the likes of Blue, Tropical Fruits and Orange & Passionfruit in the VK range. Jen Draper, head of marketing at Global Brands, said: “Fans of VK have spoken in their thousands and they want Watermelon. UK-based Global Brands experienced a 16% sales increase for its 2017 fiscal year. Sales of VK “outperformed” in the UK market to reach the number one position as the best-selling RTD in the UK on-trade, with volume sales growing by 20%.